How do you spend money to save time? Home » Life Hacks » Productivity » How do you spend money to save time? "You can always make more money, but you can't make more time." The staunch followup to that tends to be that you can make better use of time. I've been thinking a lot lately about tiny — even "microscopic" — shifts in my daily activities that add up big in the long run. For example, one of my faves on the computer is setting up PhraseExpress text macros to auto-paste frequently-used snippets of text, cutting down 10 secs of typing into a 1-second keystroke on each pass. Not to mention the memory overhead of needing to recall each snippet. When each instance is viewed in isolation, that's not very much. But multiply that over weeks, and the savings are phenomenal. Another one of my fave habits is to batch-process documents: I stack stuff I need to scan and archive into a shoebox, then every couple of weeks or so, I put on lovely music like Philip Glass and start an intense half-hour to an hour of filing them all. This removes the overhead of switching between tasks, since each time I do this, I need to arrange the scanner and documents, and go through a series of steps that are simply more efficient when done in one "swell foop" than piecemeal. Having such concentration also adds to getting the task done effectively. It's economy of scale applied domestically. Like any healthy habit, these involve repetition. But the smart kind. Spending money to save time is a must for resourceful people, since there are some things which just about anyone can do, like raking leaves or mowing the lawn. However, if you have creative inspiration or life dreams that only you understand (at least so far), there's no way you can transfer your innermost tasks to have them carried out, let alone communicate them to another person. More importantly, while someone you've paid is doing what you consider a boring task (and don't feel bad — it's a fair exchange of money for your focus), you're in a position to generate even more wealth, whether it's rolling in net dough or spending quality time with family. In fact, one commonplace but no less important money-for-time exchange is paying a babysitter so you can enjoy a night on the town with your sweetie. The thought that you love your kid less because of this is absurd. On a grander scale, books and blogs on "outsourcing your life" have gotten popular, with many copycats tagging on Tim Ferriss' coattails. While you'll never want to entrust some personal tasks to others, the next time you feel time-crunched about a recurring activity that someone else could do — especially if it feels like a tiresome déjà vu — consider doing what I call a CLE, or "Cheap Lightweight Experiment" to test if more life automation may be right for you. Whether it's hiring someone to do manual labor or using the Amazon Mechanical Turk to "hive-mind" some info you need, there are plenty of options. Spend a few bucks and observe the results. I challenge you to: get stuff you're used to doing in an hour… done in 45 minutes or less. This could very well mean your work, due to a higher sense of structure and ordered tasks there. But it could just as easily be a household chore or other recurring activity at home. This doesn't mean you'll rush through it carelessly. It means you either become more intense about finding shortcuts or not doing/ignoring unnecessary parts (and there almost always are if you look really closely), or delegating/outsourcing it to someone else entirely. I find practicing this every day of my existence not only makes me sharper, it helps me to have more useful fun — what I often portmanteau as "usefun" — because events are more memorable. My comprehension and self-awareness increases. I care more, and I'm far better off than, say, someone who isn't just riddled with distractions, but is merely doing an "OK" job and not looking to get more out of all those little slices of time that pass us each day. That's such a sloppy waste, especially when there are so many opportunities to invest in a tool or pay a person to help us make better use of our time. In turn, when you're stretched out and relaxing — whether it's in our bed or on the beach — you'll feel that much better about it. You've optimized what needs to be tight, and now you can enjoy the slack. As tough as it can be to avoid when you're in a jam, penny-pinching at the expense of feeling freer isn't really saving money at all. It's like hoarding a small treasure in a locked room when there's so much gold to discover outside the door, as scary as it may seem. 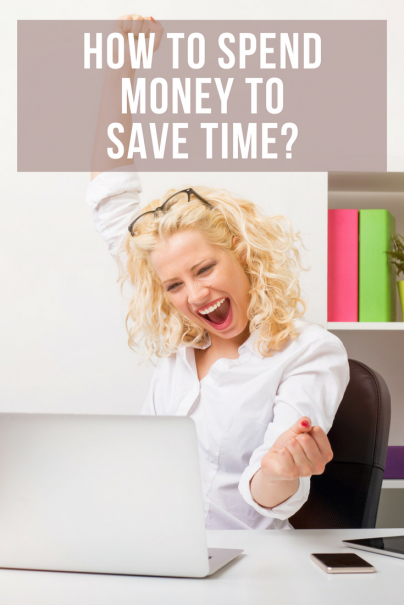 Do you regularly and consciously spend money to save time? Or is something you're still afraid of? And if you have questions about my specific processes, please ask! Editor's note: This post was selected for The Best of the Best in Money and Personal Finance carnival! Every time you drive fast to get somewhere you're going quicker you are spending money to save time, so I think we've all be there. Outside of that I go to convenience stores for a Mt Dew when another 3 minute drive would get me 2 liters for the same price. My guiltiest moments where when I bribed my (then girlfriend) to do laundry for me where she got dinner in return. Kind of like a maid! Um, what's up with that photo? It's slightly disturbing! I always wonder if it is a fair exchange driving to save time. What the heck is with the photo? Seriously disturbing. Not sure if it is supposed to be funny, but it's definitely not. Uhhh... I couldn't even concentrate on the content. You photo is really messed up. because you actually have to invest time to make money in the first place. ok you can probably make more money per minute with your time investment than it costs you per minute to outsource the boring tasks and you end up in the black. but don't forget where money comes from! A great article i have read......people always say "time is money" but you proved them wrong......from now i will always remeber your article. Time or money-- what's more valuable? If you think about it, you will realize the answer is time. The sad part, is that people squander time more than they squander money. As an example, just think TV . . .
Time is more valuable because you only get so much of it-- time ticks away and is gone forever. Think of time as a decaying asset. Money on the other hand, can made and remade. Time should be guarded and used sparingly. BTW-- what's the story with the Texas Chainsaw photo? I guess the photo is supposed to illustrate why doing some household chores yourself can be a false economy? Still, it's a disturbing photo. I'd have gone with a guy lying flat on his back with a ladder on top of him and tools scattered about. Just checking the comments to see if anyone mentioned that photo...wow. Sometimes I pay ATM fees based on a time/money analysis. But really, whenever I find myself at an ATM machine paying a fee, it's because I planned poorly. Sure, it might not be worth the extra time to find my bank's ATM at that moment, but had I planned better, I wouldn't have to think about it or pay for it. Okay, I thought the picture was kind of funny, personally. Maybe you just had to grow up w/ my siblings. I spend money to have my grass cut monthly and to have my house cleaned every three weeks. It'd certainly be cheaper to do either myself (well, in fairness, I'd have to buy a lawn mower, but whatever), but I value the time I save AND the misery I get to skip (both activities are so sucky in my mind that it's worth the money to skip the misery) so much that the money is really nothing relative to what I gain. The cooking, however, I still do myself. It's a joy for me so I'd lose out all around otherwise. how is the picture related to the post? The photo is a psychological test. If you click through to allygirl520's stream, you'll see there's a lot of love behind those two relatives. So on that one level, it's not as it seems — and relates to this article, because the relationship between "money" and "time" is often not as it seems. Using both resources brilliantly calls for an unorthodox, unscripted reaction. It can be uncomfortable to talk about because it unseats long-held values about ourselves, but once out in the open, invites refreshed action! @The Weakonomist I wish I knew more about that, I don't really drive. But your "Kind of like a maid!" made me chortle. If the agreement is mutual and ultimately doesn't destroy one party, it's prolly healthy. @utility73 Yes, so how to do it most effectively? Often, initial setup of repeat tasks will save you a lot in the long run. Weigh that. @DDFD When I think "decaying asset", chemistry (half-life) comes to mind. @Meg That's a common and very worthwhile example. Just as many of us don't make our own clothes. @rob rubin One of those "in the moment" decisions, and speaks to how we might pay more if time is scarce (either by choice or force, like last-minute concert tickets). @Allie Thank-you for sharing, and I'm glad you found the pic kind of funny. It unsettled me too at first, but then I dug deeper and found out what was happening. The picture needs an article of its own. as a faithful wisebread reader I find this post's photo to be inappropriate. You've gotten your reaction from the readers, most don't seem to like it anymore than I do. Please take down the photo or explain it in your post. Next time, depend on your writing to get readers, not sensational/disturbing photos. Calm down people. The picture is of a dad playing around with what looks to be his daughter. It's not a picture of Dahmer killing a victim. My god, don't any of you people have kids? Or perhaps grew up with siblings where you did ridiculous stuff to each other? What a bunch of insulated sensibilities. Seriously.